The holidays spell food coma, but if you’re the one slaving over the kitchen stove, it can get quite hectic. Whether it’s cooking for a small, intimate family dinner, your clan’s annual potluck reunion, or baking a batch of cookies for holiday gift-giving, it always helps to seek out new ideas, especially when we’re this close to the homestretch. Among the things I like getting ideas from is Yummy Magazine. The December 2012 edition is, predictably, full of everything Christmas and the holidays. Aside from holiday recipes that range from the traditional to the unique, there are also interesting food recycling ideas that make good use of too much keso de bola and ham. 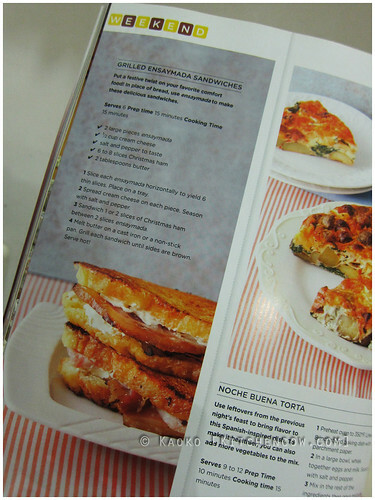 Think a leftover chicken galantina sandwich, as well as a grilled ensaymada sandwich that’s stuffed with a thick slice of Christmas ham. I’m almost wishing it was after Christmas already, just so I’d have leftovers to mess with. Aside from the seasonal recipes, there are also the usual everyday dining ones. While we’re always admonished to make everyday Christmas day, if you’re doing the cooking, I’m sure you’d like some one-pot recipes, too. For this month, there’s a selection of different stews — one for each day of the week. If you’d rather not cook, there’s a long list of food purveyors with holiday potluck offerings, too. Complete with descriptions, serving sizes, prizes and phone numbers, there’s something that’s sure to impress your hosts and co-guests at the next potluck. Gift ideas also abound in this issue. There are artisanal food offerings, special kitchenware, cookbooks for the kitchen junkie, convenient food gifts you can pick up at the grocery, and homemade gift ideas like Christmas-themed salt, marinated feta and Turkish delight. Heck, even the advertisers have outdone themselves this issue, with truly yummy-looking product driven recipe features that I wouldn’t turn my nose up at. I know I’ve already noted some that I’m looking forward to trying after the holiday rush is over. Get a copy of the December 2012 issue as soon as you can. But if you really don’t have time before the holidays, do grab it before the month is over. It’s a wealth of ideas that you’ll enjoy even after all the celebrating is over, letting you extend the festive cheer. Kitchen Cow received a complimentary copy of Yummy Magazine December 2012 for review purposes. All opinions are reviewer’s own. No compensation was received. This entry was posted in cookbooks and magazines. Bookmark the permalink. Hi my loved one! I want to say that this article is amazing, nice written and come with almost all important infos. I’d like to peer more posts like this.